The biggest networking event on our annual SANA Calendar is the annual SANA Convention. This event is hosted in May/June each year and incorporates our Annual General Meeting, the announcement of SANA, GCA and Supplier Awards, top class speakers and association forums. The 2019 SANA/SAGIC Convention will be held at Arabella Hotel in the Western Cape from 5 – 7 June 2019. 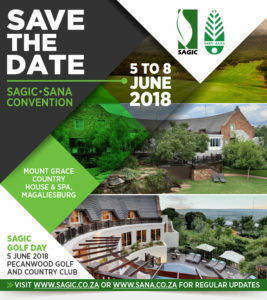 The SANA and SAGIC Convention was held at Mount Grace Country House and Spa from 6 – 8 June 2018. This was SANA and SAGIC’s third joint Convention, and what a success it was. The Convention format was a two-day event with day one being focussed on SAGIC and networking between associations. Day two focussed on each association’s activities. The event was a great success with 140 full delegates from both associations joining us. The GCA Competition top awards, Supplier Awards and SANA Awards were handed out during the course of Convention. Industry golfers had the opportunity to play on the beautiful golf course at Pecanwood Golf & Country Club as part of the SAGIC Golf Day. The prize giving was held at the golf club, with Ice Breath Trading walking away with first place followed by Africa Lawns in second place and Tuberflora in third place. Congratulations to all! Delegates who opted to arrive a day before the official start of Convention, enjoyed a lovely informal dinner at the hotel. The convention commenced at 11h00 with a welcome from SANA President, Tanya Visser and SAGIC Chairperson, Ida-Marie Ehlers. Thereafter delegates enjoyed a presentation from the dynamic Bruce Whitfield. He highlighted our current economic situation and shared wise words from business leaders in South Africa. After a delicious lunch, delegates returned to the plenary venue for presentations by industry speakers – Dr Kara-Lee Prinsloo and Morne Faulhammer. These speakers were followed by a surprise speaker – Paul Wittaker of Quirki Strategy by Design. Afterwards, delegates enjoyed some free time to relax and freshen up before dinner. At dinner, Gavin Edwards entertained guests with his performance and everyone had a great time. Day two started with a presentation from Zelda la Grange who served Nelson Mandela in different capacities for 19 years. She spoke from the heart and brought quite a few people to tears. After tea, SANA and SAGIC split into two different sessions for the day. Tanya Visser, SANA President did an official SANA welcome and Sponsor acknowledgement. Thereafter the GCA Garden Centre Competition Regional Awards were awarded, followed by the Young Retailer, Young Grower and Young Sales Representative Awards for 2018. Congratulations to Daylin Gibbons (Lifestyle Home Garden), Sandiso Xinindlu (Elands Nursery) and Freddie Makhubu (Andy Titterton Wholesale Nursery) on receiving the respective awards. It is young leaders like each of you who make our industry thrive. The awards were followed by our 71st SANA Annual General Meeting that included reports from the SANA President and Vice Presidents, Financial report back and the information meeting where feedback was given on Life is a Garden, SANA Tom Arnold Bursary Fund, Natural Resources, Education and Training, IGCA and Industry memberships. Before the close of AGM, Peter Runkel was inaugurated as SANA President for the term 2018 – 2020. He presented his inauguration speech and introduced the new EXCO to members present. Peter expressed how his goals as SANA President are motivated by his desire to do all he can for the continued effective operation and viability of SANA. Our AGM was followed by lunch and the afternoon session. Supplier and Retailer Competition Awards were handed out (see the winners listed below). Nicky Weimar, Nedbank Senior Economist, gave us the facts on our current economy and what influences it. Thereafter, GCA and ABSTA had their respective AGM’s where new chairpersons were elected. Congratulations to JJ Jv Rensburg (Garden World) and Johan du Preez (Starke Ayres) on their appointment as GCA and ABSTA chairperson respectively. Delegates enjoyed some time to relax and get dressed up for our black tie Gala evening. The theme was “Great Gatsby” and everyone looked amazing with pin stripe suits, hats, flapper dresses, beads and loads of sparkle. The SANA Merit Award, Service Award, President’s Award and the SANA Gold medal were highlights of the evening (see a list of the recipients below). The excitement was almost tangible as the Top GCA Competition Awards were announced. Everyone mingled with one another and congratulations were shared in celebration of the awards received. Festivities lasted well into the night and everyone enjoyed the music, dancing and networking. Slowly, one by one members disappeared to the luxury and warmth of their beds and the celebrations came to an end. Visit our Facebook photo album for photos of the event.